If you’re in a hurry, check out our top pick, Ergotron WorkFit-D. Sitting too much does not only increases the risk of cardiovascular diseases and other health problems such as diabetes but also study say it may cause us death even if we exercise. According to the World Health Organization, physical inactivity has been ranked as the fourth leading cause of death among people in the world. It’s either you sit when you drive, when you watch TV, when you work at an office, and when you eat. In 2013, a study showed that an average of ten heart beats per minute caused by using a standing desk is equal to an additional fifty calories burnt per hour. According to the Mayo Clinic, prolonged and uninterrupted sedentary causes a slower metabolism rate with a greater metabolic risk which is even associated with type 2 diabetes and heart disease. Sitting for long hours straight is not highly recommended so professional physicians and health practitioners advise to stand and walk for a little longer to let your blood circulate well. However, this will take much time from your work, causing more delays and over time problems. The best solution for this is to have a standing desk so you could still work while you are standing. Why do you need a standing desk? It’s simple. You need more energy when you work and standing will keep your blood circulation and mind more active. When you are physically inactive, you tend to feel sleepy. Standing will make you more productive and help you accomplish more work than expected. Often than not, people always complain about back pain, muscle cramps and numbing. But sources say standing desks will help you maintain your good posture and core strength. It will lessen the pain you feel in your back and tailbone unlike sitting all day. Additionally, due to the extra energy acquired, standing at your desk while working enables you to grab a responsibility or shove off any danger at a quicker pace. On the other hand, prolonged standing has also its own sets of risks and disadvantages. Safe and Easy-to-use. When deciding to buy your own standing workstation, you do not just choose a desk. You have to consider a great adjustable desk which you can swiftly, quietly and safely shift from a standing height and a sitting height. Stability and Reliability. You also have to consider the sturdiness to hold the weight of the load and the locking brake mechanism. Durability and Quality. Choose a standing desk that can offer you satisfaction and guaranteed long-term use. Good Cable Management Options. This will help you organize the cables on your working desk and prevent further accidents. 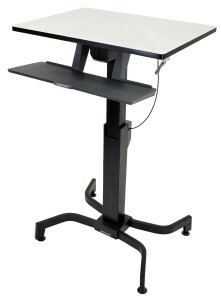 Considering you’re not tight on your budget, take this sit-stand desk by Ergotron. 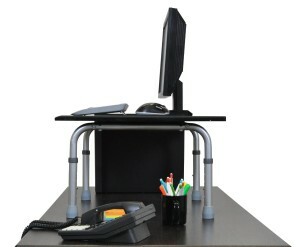 It is an adjustable, quality standing desk which enables you to work according to your desired position. 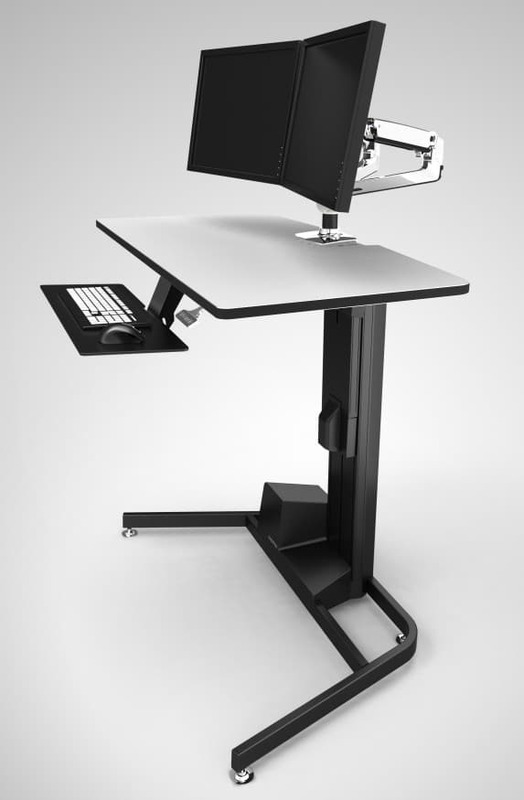 Designed according to the demands of the North American and European ergonomic standards, Ergotron ensures the safety of the user as an integrated brake system was devised to halt any movements and secures the desired height in place. And you can just easily release the lock once you want to adjust. This desk is a customized work desk as well as a computer station easily accessible for your reach. While you worry about adjusting, WorkFit assures an easy operation that does not involve any cranks or motors that restrains you to move it. Mounting an accessory in the desk can also be an obvious task while you can easily attach and detach as you customize your own workstation. Now, problem solved. You can sit and work and/or stand and work while not worrying about health issues. Overall, the quality is assured as the materials used are a top-notch and it may be used for a long term. Its counter-balancing adjustment mechanism makes positioning simple, using patented CF technology that provides fluid, one-touch adjustment. The adjustable Neo-Flex Underdesk Keyboard Arm attaches under the worksurface, placing your keyboard and mouse at the optimum position for you. LX LCD Arm gives you an increase viewing comfort while extending the reach of your display: Up. Down. Forward. Back. The LX provides unparalleled range of motion and allows you to Mount two monitors with a dual arm. If you are looking for a standing desk that will fit in your budget, here are our picks for the 10 best Sit-Stand Desks for your work space that will make you productive and healthy. The 24” desk has been substantiated as an effective workplace primarily designed for your desktop providing space for your screen monitor, keyboard, mouse, etc. With 24 inches width, 22 inches depth and 11.5 to 16.5 inches length, this standing desk does not require so much time and effort for the assembly. Its portability and easy access makes it quite the catch. As you adjust the height per one inch of accretions, snap buttons serves as the adjustment knobs. You can also use the space below where the adjustment was made and increase your productivity level while you finish your work. As the price suggests, it is not only a budget-friendly but it is also proven for its quality standard and the amount of its effectiveness. This 24 inches height standing desk allows you to easily adjust the desk by one inch degree to six distinct heights. It can hold a total weight of up to 35 lbs. with the total item weight of 16.5 lbs. 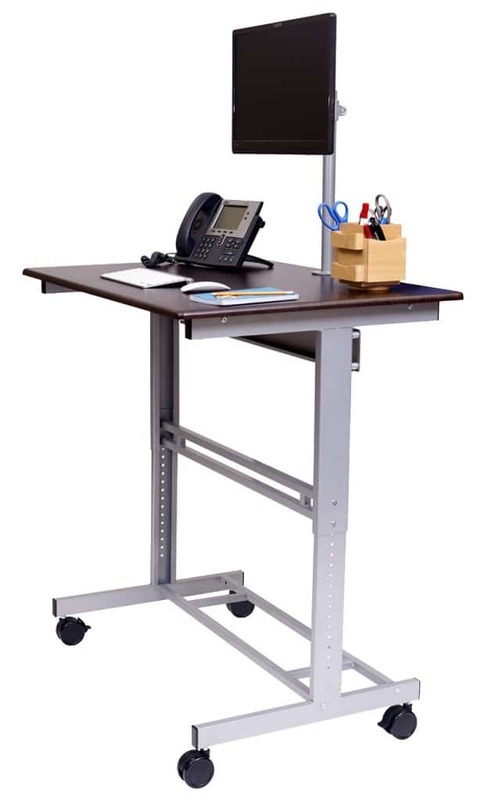 With the surface specs of 39.25 inches width, 28.5 inches depth, and 28.75 to 42.75 inches height, this mobile adjustable-height standing desk is also known for its sturdy frame with silver gray powder coat paint. It also provides a larger shelf where you can use for further activities or mount accessories. Adjustable one inch accretion and monitor mounts make it more effective and useful for your work loads. You can tilt, swivel and adjust the monitor mount to your desired height. This desk can also be easily moved to any part of the room with the aide of the three inches furniture small wheels and two locking brakes. It is designed with dark walnut laminated shelves and silver coated steel frame. The monitor mount can be tilted, swiveled, and adjusted but it can’t be moved closer to the user. Unlike the Mobile Adjustable-Height Stand Up Desk, Sierra Height Adjustable Desk is about two inches shorter. The width is 37.5 inches with a depth of 20.5 inches and a height of 29.25 inches to 41.25 inches. The adjustment knobs are designed on both sides of the lever where you can perfectly suit yourself with your intended height. While you worry for a rusty frame and skid work desk, Calico Designs showcases a powder coat painted steel frame and non-skid rubber base. Hence, the durability and good mounting is guaranteed. Furthermore, just like the former product, this desk could also be easily transported from one room to another. Two casters are designed for mobility with a lock to make it firm. 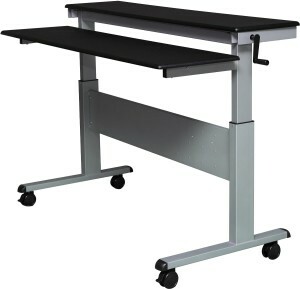 It is available in black and silver, and cherry and white colors but the information provided above is for the cherry and white sierra height adjustable desk. It holds a total weight of up to 39 lbs. 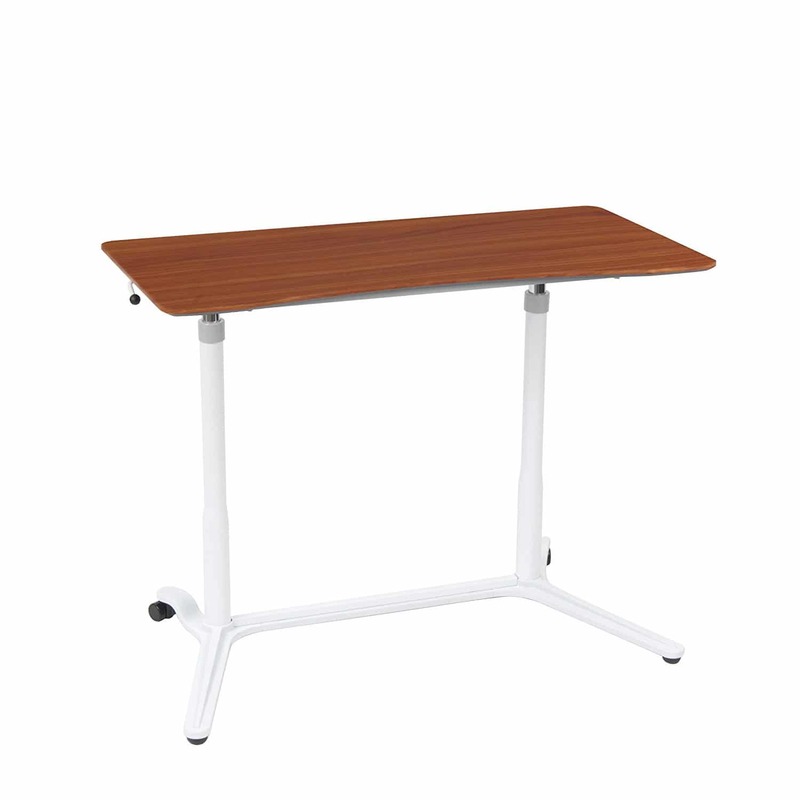 From 35 inches to 49 inches height adjustment, the Muv Adjustable Height Stand Up Desk is also comprised of melamine laminate superficial and shelf. Three fourths of this lamination assures durability. The side panels are effectively designed and constructed to hold and conceal the computer cables at hand. You can use the two shelves provided to keep your things tidy and organized. The third shelf could be for your keyboard or you could always draw back beneath the work surface if you decide not to use it. 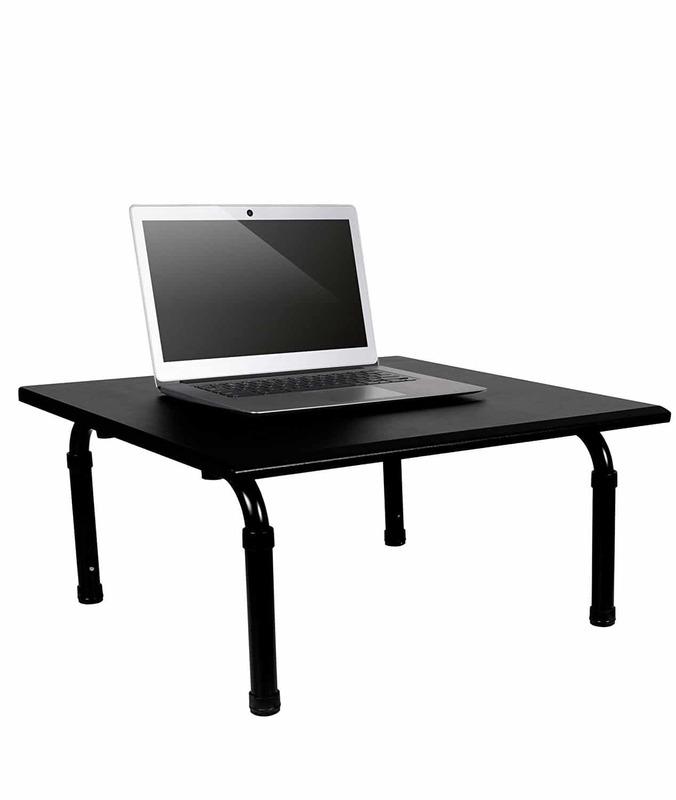 Furthermore, the standing desk provides four casters and two locking brakes for its mobility. Although this design may require some time for its assembly, it assures durability and improvement in your productivity. Designed side panels are provided for the organization and concealment of your computer cables. Available in a cherry color, the frames are steel and the shelves are made out of compressed wood. It can hold up to 100 lbs on the main shelf for desktops; the keyboard shelf weight capacity is 25 lbs; and the middle and bottom shelves can hold a total weight of 50 lbs each. While you worry about you’re your health, this 60 inches crank adjustable standing desk provides a new specs for the customers either for sitting or standing. Now, you can adjust your work table from 28.9 inches to 42.6 inches on its lower layer to 33.5 inches to 47.3 inches on the upper layer. It also consists of two shelves designed for your monitor screens on the upper surface and the keyboard and mouse on the lower surface. The crank adjustable height standing desk is known for this “two-tiered” shelf system for a solitary working space. Now, you don’t need to worry for its frames as it is painted with silver gray powder coat. Hence, this may take you years to keep using it. The crank is designed with black shelves and heavy duty silver steel frame. It smoothly lifts and lowers with the use of the crank adjustment, now available in an electric adjustable model. Perfect for multiple-monitor users, Pro Plus 36 is patterned with a larger working space suited for two monitors in place and a different shelf for the keyboard and mouse. 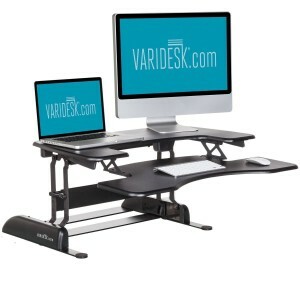 Varidesk boasts off its own patented spring-loaded elevating system which easily rises up to 35 lbs. within three seconds. With this, you can easily focus on your work as you sit and stand without losing your concentration. Because the manufacturer cares about its customers, the height can be adjusted to 11 distinct positions. The sturdiness and stability is still maintained even when totally adjusted. And good news for you, the product comes assembled and installed once you take it off the box. Try working using this design and help yourself boost your health as you work calmly and productively. You can work even with two monitors on the desktop shelf. Aside from the spring-assisted lifting system for the height adjustment, pro plus 36 also boasts off its lifting keyboard deck. Easily set-up and it can hold a total weight of 35 lbs. Designed best for its electric operated push buttons, this electric stand up desks suits its name perfectly as it works best with its automatic adjustment mechanism. 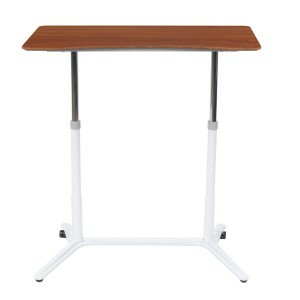 The electric buttons enables the desk to rapidly adjust from a sitting to a standing position within 20 seconds. With regards to its height, expect a range from 29.5 inches to 45.25 inches adjustment. 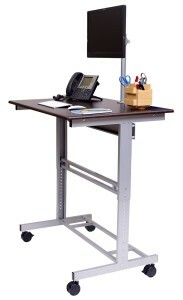 Using this innovative standing desk, the company offers free basic information with a 15 feet three outlet power cable. 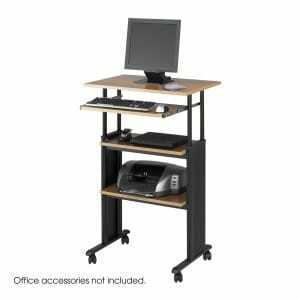 Furthermore, the electric standing desk provides easy access to its mobility. Having three inches furniture casters and two locking brakes, desk locks are also designed to secure the stability of the shelves. Enjoy working with a larger space, improve your health with the adjustable system and reduce your time manually adjusting with the electric push buttons. 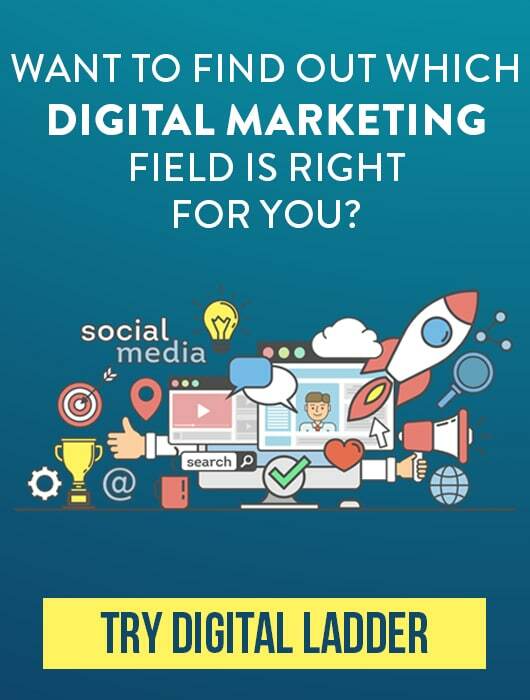 What else are you looking for? Well, the standing desk also comes in plenty of genuine colors to suffice your style. Furthermore, heavy duty steel furnished with powder coat paint assures you for a long term use. It is available with a gloss white desktop and white frame. The maximum weight capacity is 154 lbs. Safe and easy-to-use, just two of what consumers are looking for in a thing. While you having a hard time adjusting your work desk into your desired height, you can always come up with this innovative design. Moving while sitting and working is a little bit difficult on most parts especially if you are in a small-sized room. Sometimes, it takes you so much time to organize your things leading you into office work troubles and messy work place. 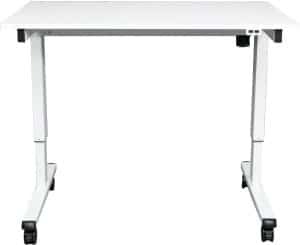 But now, these things will be easier with the ergonomic standing desk customized with integrated brake system that secures the firmness of the table. The WorkFit-PD is designed for the convenience of the customers as it boasts off worry-free output. It consists of a counter-balance adjustment system which makes the positioning a lot simpler. This mechanism uses patented CF technology-providing fluid, and one-touch adjustment. To ensure the quality of the product, the company made a quality-testing administration. This covers the overall quality to assure years of trouble-free, and the sit-stand adjustment feat. Either sitting or standing, the sturdiness of the desk remains solid during the mousing, keyboarding, writing or any other related activities. Furthermore, other accessories could be customized in your own workstation. Lessens assembly time as it comes fully assembled and the WorkFit-PD can hold a total weight of 40 lbs. A firm base with four leveling glides that can be adjusted are designed for uneven floors. The Single LD Kit or HD Kit is for a single display; the Dual Monitor Kit is for two displays and order LCD and Laptop Kit if you are using a notebook computer. The PD provides a space for your CPU and the WorkFit-PD comes with a cable management box. Take note that the keyboard tray is removable if you wish a little more space. From 24 inches to 50 inches, the ApexDesk standing desk is designed with three-stage dual motors with 235 lbs. load capacity and two-button controller. This makes it easier to adjust the height in 1.3 inches per second. 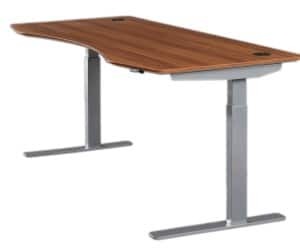 While the lower frame is made up of one piece center beam, the standing desk is more stable compared to other desks with crossbar. The ‘under frame’ is ensured with a heavy-duty quality frame. Additionally, you can comfortably extend your leg as it does not have a crossbar and offers flexibility. 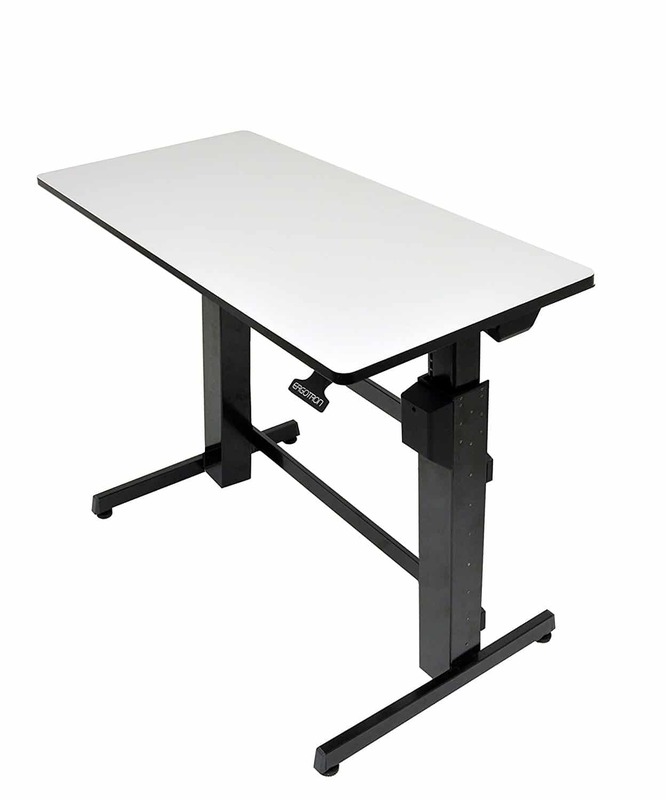 The ApexDesk guarantees the quality of the electric height adjustable standing desk. While most desks are manufactured with low-grade particle boards, the product is made up of scratch-resistant high-pressure laminated MDF (Medium Density Fiberboard). However, it will take you less than thirty minutes to assemble this thing. Be patient. It is available with a red apple laminated MDF desktop and silver steel frames. The Medium Density Fiberboard (MDF) protects the desk from scratches and high-pressures. For additional stability, the underframe is made up with one piece center beam. 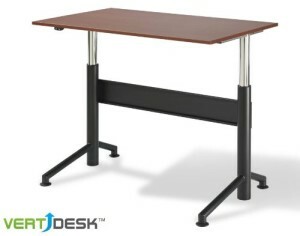 VertDeskTM 30 inches by 60 inches is also designed with a push button that controls the height adjustment automatically. From 28 inches to 46.5 inches, the average elevation capacity is 200 lbs. you don’t have to worry about manually adjusting the desk because you can still continue on working while the desk rapidly and quietly adjusts on its own for 1.1 speeds per second upon button push. Unlike the ApexDesk Electric standing desk, the VerDesk TM is designed with a crossbar that holds the height firmly. Aside from the high quality German gear, the product ensures spindle drive mechanism and smooth movement performance. However, to start it working, you have to plug it in any 110 and UL-approved outlet. Don’t worry about the legroom as it has a 22.5 inches leg space provided for your convenience while seated at the desk. It is available with a cherry desktop and black base. The maximum capacity weight of the desktop is 200 lbs. Working for a very long hour is stressful and working in front a computer behind a lousy work desk is even more stressful. If you value your work and health, it’s more practical to invest on a good standing desk that does not require much of your time, effort and money. The list above may give you some ideas and information to help you out before purchasing the right standing desk for you. Tell us what you think and what among the standing desk suits you best. Sharing this might also help out some of your friends out there.